Why The Hell Do You Put Your Car In Park At A Stoplight? So, I’ve seen this a lot in my many years of wandering the roads in America. I’m still baffled by it: why are people putting their automatic cars in park when stopped at a stop light? I’ve seen both regular and taxi drivers do this in all the cities and towns I’ve visited. I can always tell when people do it, too, because the backup lights come on briefly from passing the shifter through reverse to land in park. In fact, I distinctly remember a friend in high school who did this. We rode up to a stoplight in her Honda Accord and rather than sit at the light with her foot on the brake like I assumed most people did, she put it in park and took her foot off the brake! It was mystifying! Don’t you feel better with your brake lights on when you’re stopped to make extra sure that nobody rear-ends you? I asked my colleagues. They were all equally bewildered. Except for David, who said that he sometimes put his car in neutral when stopped at a light. The only times I can remember that I’ve put my car in park when I’m not parking were times when I was sitting in 45-plus-minute traffic jams on the highway with no hint of movement up ahead. In those cases, most of us just turned our cars off. But for every day waiting-at-the-stoplight? Never. Do you do this? Why? 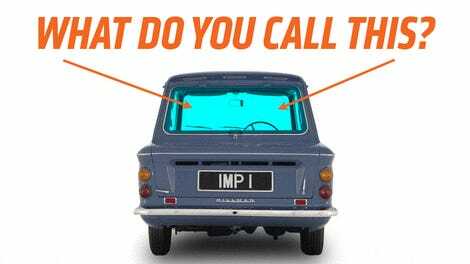 Rear Window Or Rear Windshield? What&apos;s Your Car&apos;s Favorite Tool?